Ivoryton Playhouse Ivoryton, CT SPT $500. Prepare a song in the style of the show. Sides will be available by July 3rd. Follow this link to view the sides. Call 860-767-9520 ext 203 for appointment. The show features 2 male and 2 female actors who, between them, play 58 characters aged 30 to 80. All four need to be extremely good vocal artists as the songs feature close harmonies and a wide vocal range. Ability to read music and sing a cappella is essential. [WOMAN 1] female – late 20s to late 30s. An honest, charismatic, appealing, and terrifically versatile actor with strong comic timing. Excellent singer (Soprano–low A to Bb). [WOMAN 2] female – late 20s to early 40s. An honest, charismatic, appealing, and terrifically versatile actor with strong comic timing. Excellent singer (Alto–low F# to Db). [MAN 1] male – late 20s to late 30s. An honest, charismatic, appealing, and terrifically versatile actor with strong comic timing. Excellent singer (Bari-tenor– middle C to Ab). Tent events are casual, pre-theatre gatherings free for ticket holders. The July events listed below start at 6:30pm prior to the 7:30pm performance of Footloose. Why not join us on a Wednesday and bring the whole family! CMS has been enriching the Connecticut Valley-Shore communities by offering outstanding private and group music instruction for all ages since 1983. Public performances and community outreach programs are a key part of our nonprofit mission, and we sponsor many ensembles, orchestras and events covering a broad spectrum of musical interests. Footloose ticket prices for under 12’s is $15.00 – student prices just $20.00! July 17 Cowboy Night – one for Cowboy Bob! Boots, bandanas and spurs welcome! Wings and sliders provided by Ivoryton Tavern. Wine and beer supplied by Shoreline Discount Liquors. Classic country and western music performed by Jeff Martinson. Looking for something to do with the kids? Tickets on sale now for our Summer Children’s Theatre! Fun for all ages. All tickets only $12.00. Call, click or visit our box office to secure your seats. Box office: 860-767-7318 or follow this link to purchase tickets on line. 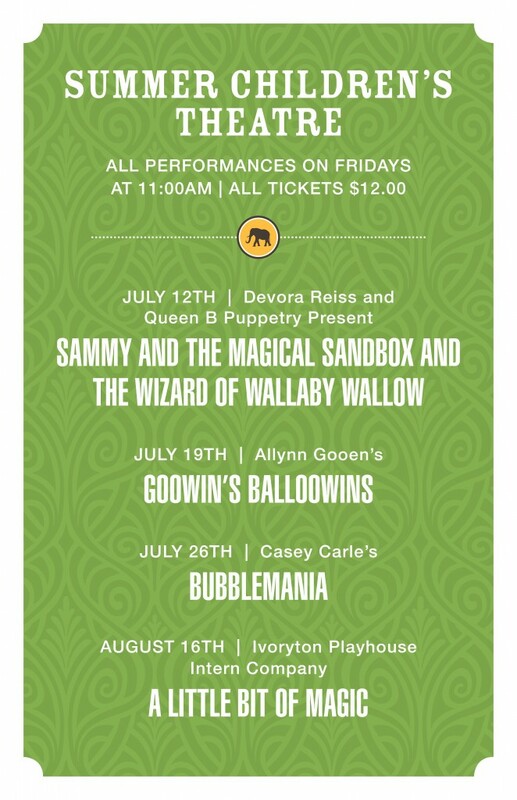 For more information on these shows, please visit our Summer Children’s Theatre page on this website. You’re Invited to the “Fun”draiser of the Summer! Note: While my Dad made it through the depression and World War II, his birthday was December 26th. Cakes were hard to come by in those days, and he complained that he was destined to have fruitcake every year. He discovered this recipe and it was much more to his liking. I don’t know if he created it, but I definitely know he did not find it “online”. As he was a foodie long before it was popular, I am delighted to share this recipe to all those who enjoyed it. I can see him laughing right now. Happy Father’s Day, Dad! With love and thanks to Barbara Harrison for making the cakes for us used in the show and for sharing this special recipe! Thanks, Barbara!! Follow this link to read the whole review. I’m Connecticut opened to the sounds of uproarious laughter and audiences LOVED it!! It’s quirky, funny and you can’t go wrong with a big musical number at the end, right?! Are you from Connecticut? You’ll love this show. Do you have a friend from Boston? You’ll love this show. Ever been to Vermont, New Hampshire, Florida or Oklahoma? You’ll love this show!!!!! last night but I couldn’t stop laughing. Click here to purchase tickets to I’m Connecticut. Playing now until June 23rd.